A marmot was murdered on the mountain last night. I found her shot in the back just inches from her rock shelter home. I was alone at my camp after a full day of hiking when I heard the single shot. “Marmot,” I thought, as I’m familiar with the marmots who serve as guardians to the pasture where I’d just seen the shiny red truck. Repeated shooting followed the single shot, which lasted for several minutes, and then the sound of ATV’s tore up the air, before leaving. My pounding heart lasted longer than the alarm cries of the birds and soon three adult does with two young ones appeared in my camp, quietly grazing. I took a cue form my wild friends and focused on trusting that the danger was over. Earlier that day I had several delightful encounters with marmots—I found a large ruddy marmot sunbathing on a rock in the middle of an elderberry patch. 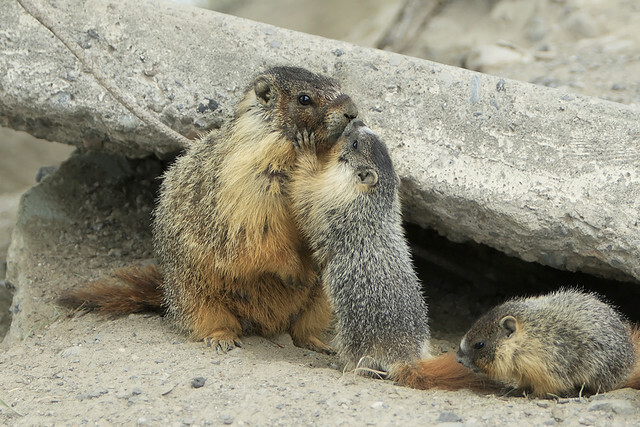 I witnessed a momma marmot nursing her little one as she stood on hind legs sniffing the air to catch my scent. Later, on my return on the trail, this same momma was keeping an eye on her little one who was now foraging alone in front of their home. And as I walked through the meadow to my camp I smiled when the guardian marmot whistled out at me in my passing, as has happened in all the years of my visiting this place. On my departure the next day I was walking with my camping gear, and with a bag overflowing with the dandelion leaves and flowers I just collected, taking in the wild Beauty of the late morning. Birds were still celebrating this never been seen before day, and an array of butterflies were visiting wild flowers in all their summer colors. And of course there was the rushing river dazzling in sunlight. Up ahead several cattle were on the path and I thought about taking the high ground. But as I got closer cows and calves started to move and to my dismay three vultures lifted from the rocks I associated with the marmots. “No! No! No! Please, no, “ I yelled out loud as I saw a young cow sniffing a red splotch of fur on the road. James Hillman writes about the inability to sense another living creature as anything but an object. That “those who have lost the response of the heart to what is presented to the senses, are sometimes so trained to believe that the objects outside them have no ‘feeling reality’”. As a culture we aren’t taught that animals nurse their young as we do, live in shelters as we do, have complex social networks as we do and provide invaluable service to the ecosystem. We aren’t taught how to be in relationship with animals and all of Life as our relatives. When I started this blog, my intention was to only write about what is inspiring and for years I’ve endeavored to carefully speak a truth from a place of Love that others can hear. While these intentions are important I’m aware of how I’ve squelched my rage and I know from appropriate rage there is the energy to act. To embody the energy of the Goddess Durga the warrior protectress, who fiercely stands up for what/who she loves like a rage-full momma bear. The energy to take a stand for an Earth where rivers are free of dams and pipes, where food isn’t genetically modified and mountains aren’t reduced to aluminum cans. The energy to take a stand for an undomesticated Earth where all Beings thrive in their wild Nature. Over Spring Equinox 2014, 800 women gathered at a private ranch outside Sedona, AZ to recognize World Water Day. The four-day event spiraled around a visit of the Thirteen Indigenous Grandmothers who are traveling the world to provide counsel in how to navigate these challenging times. Instead of rhetoric or a spiel of facts about the perilous state of water, the grandmothers took turns teaching us how to pray. Of course, prayer is a very individual practice. In my experience at this and other water ceremonies, each person is left to pray in their own way. This is what the grandmothers exemplified as each took turns in their actual expression of prayer which was steeped in the culture they came from. Often an hour would pass as we witnessed a Grandmother in full connection to and communication with a power greater than herself. “Prayer works,” said Grandmother Rita from Alaska. She then gave the example of how all the dams were removed along the river of her homeland, so now the salmon can run free in their native waters again. In the fall of 2009 my friend Abby was out hiking on Boulder Mountain in SE Utah when she discovered employees from the Department of Natural Resources (DNR), dispensing a liquid from backpack sprayers into East Fork Boulder Creek (EFBC). When she asked them what they were up to, they reacted defensively and told her they were treating the creek as part of a program to reintroduce native Colorado Cutthroat Trout. On our way down the mountain we encountered dozens of fish, dead in their element, floating in an eddy where we chose to cross the creek. Dumbstruck and heartbroken with the reality of a poisoned creek, I picked up a fish, placed it in my empty lunch container and carried it home. “Brook trout,” a friend identified the fish I held before him. Thus was the beginning of a 2-year process of Boulder residents bonding together to safeguard the water who flows through our town, supplying irrigation for agriculture, organic farming, livestock, swimming/recreation, and for some, drinking water. DNR public relations people would show up at a town meeting filled with Boulder residents and tell use that the chemicals they were using were safe according to the “Best Available Science”. Meanwhile the research mainly gathered from Kathy McKance a research nurse and Nancy and Don Erman, ecologists from UC Davis, show that Rotenone, its carriers and neutralizers are far from safe. Together the chemicals used by DNR have been connected with Parkinson’s disease, various cancers and skin irritations. And the Erman’s have shown that the use of these chemicals have a devastating cascading effect in the ecosystem killing all aquatic life in the water. In addition to gathering research to use in an Environmental Assessment (EA), signing petitions and going to meetings, community members gathered regularly for ceremony on Boulder Mountain along EFBC. While we were a diverse group, what bonded us was our connection to the water of our land. At the ceremonies people would each take a turn offering words spoken or sung, poetry, tobacco, prayers and gifts either from where we gathered in circle or alongside the creek. And we trusted something greater was present and listening. This bond fueled each of us to keep going—to show up at meetings, to write comments for the EA, to do research and to speak our Truth to those in the FS and DNR who held a perspective that it’s necessary to poison the creek to accomplish their fish reintroduction program. In the case of EFBC each of these threads was equally important and each of us had a role in the outcome. Buhner continues, “The loss of this kind of engagement, with life in general and with wild life in particular by its nature generates deep wounds, external and internal. No longer feeling or exchanging an emotional affinity with all life, we are no longer care-full with Earth, its landscapes and its many life forms. From our care-lessness our environment becomes impoverished. And our interior world is impoverished as well. In Boulder we have all tasted wild water either directly from a spring or flowing river or in relationship with a spontaneous waterfall rushing down well-traveled pathway in a mesa during a monsoon. Water shapes us as it shapes the desert as well. We are the wild water who flows through this land. After two years, Rob MacWhorter, then the head of US Forest Service for our region, met with small groups of Boulder residents. Unlike pervious meetings with DNR staff, who were skilled at PR, Mr. MacWhorter actually listened and tried to understand our perspective. In this meeting he asked me, Kathy McKance and Matt, if we were against the reintroduction of Colorado Cutthroat Trout. When we said, no, he asked us what our main issue was. Drawing on all we’ve heard in public meetings from our community we did our best to convey that because of the connection we have with the land and the water we know in our bones that putting poison in the water is contrary to caring for water and the life in the creek. We know that when we poison water we poison ourselves and our spirit and the spirit of water both become impoverished. I almost cried, as it was the first time since this all started that it felt like someone from the government agencies understood. Strangely though the project has been on hold since then. In other states throughout the US such a stall is unheard of, so we’ve had to wonder about the greater energies protecting this land and water. At this time however, things are starting to stir as word is out that DNR is readying to start up their project again in EFBC as well as possibly Calf Creek and Deer Creek, all of which are local creeks, in Boulder. We are being called to show up for our water again. 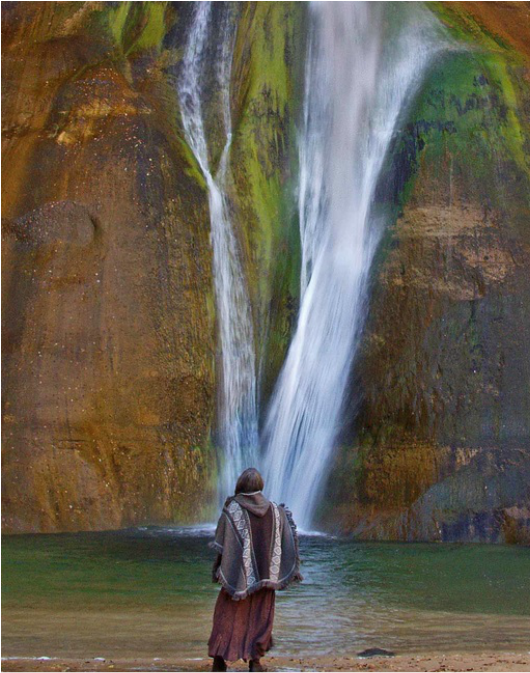 After hearing this news, several people gathered at Calf Creek Falls for a water ceremony. Those attending agreed that we are not interested in protesting what we are against but rather we were there to demonstrate what we are for. On that day we walked the trail where the indigenous people who lived along this water, ate fish from the stream and left their stories in petroglyphs high on the varnished canyon walls. It was warm for late fall and all those attending seemed to be carried by the spirit of the place. As we entered the cathedral of the falls each of us wandered to the edge of the water and danced our prayers as the cold spray of the falls washed over us. 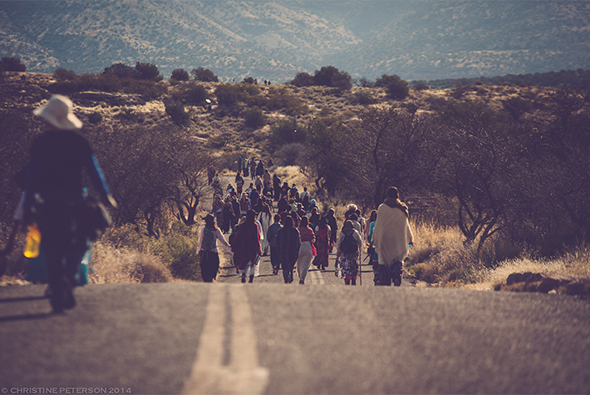 On World Water Day, 800 women dressed for ceremony in long skirts and dresses, walked the road, from the ranch to Montezuma’s Well, in Silence. Our footsteps kept a rhythm like the drum Turtle Women Rising played to keep the heart beat of Mother Earth. People in cars stopped to watch us pass. One man got out of his car, took off his hat and held it over his heart. These passersby didn’t know our purpose. No one held signs, or raised their fist while yelling out in protest. Instead our power was in our Silence, a language that touches a deep knowing and indigenous memory in ones heart, as well as our coming together for love of wild water—to pray for clean, pure, free and flowing, waters of this planet.